Repositionable FitStrips have a title on side one and a peel n’stick backing on the reverse side. 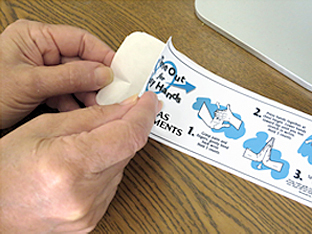 This allows you to stick and re-stick it on any flat surface - keyboard shelves, monitor frames, bookcases, virtually anywhere. UV-coated card stock. You’ll get eye-level advertising and tons of goodwill with this good-health message. Assess your stress with this temperature-sensitive biofeedback chip. Plus, tips to move you to the blue side of the spectrum. An important way to become aware of the subtle ways your body reacts to life events. More stretches per square inch than any other FitStrip! You get nine, total-body exercises to relax tight muscles and stay flexible. Our all-time employee favorite! Try this handy routine to de-stress hard-working hands. Perfect for office athletes who use the keyboard, mouse or perform hand-intensive work. Ease muscle tension caused by long periods of non-stop sitting with these seven no-sweat exercises. Only takes a minute. Keep this ten-point, at-a-glance checklist nearby to be sure your body is aligned, supported and working with the least amount of muscular effort. A must-have for every seated office worker. Perfect for workstation evaluations and office ergonomics workshops. A terrific mini-break with eye-catching graphics guaranteed to boost energy and get much needed nutrients flowing to muscles, tendons and joints. Only have seconds to stretch! Then Take Five and keep muscles warm, flexible and ready for action. This gentle fit-to-sit warm-up is the perfect way to start your workday and prepare body and mind for the tasks ahead. Computer work tends to require us to use our body predominately in the forward plane. This routine is designed to reverse the effects of working in that limited manner. Use this festive FitStrip to increase range of motion and smooth the transition between work tasks. Beautifully illustrates six fun ways to keep fit on the job. Clever safety-conscious FitStrip reminds you to Lift S.M.A.R.T. – an acronym for the five essential steps to proper lifting. Great for safety meetings. Call about our Lift S.M.A.R.T. poster. Think before you lift. Put this repositionable FitStrip where you’ll see it each day and use it as an effective routine to prepare the body for lifting tasks. A simple meditation to help quiet the mind, get centered, and improve focus. It’s a refreshing and energizing rest stop on the information superhighway. Hard-working muscles and tendons work best when they’re treated to an occasional time-out. Here’s the best way to give them what they need. This FitStrip prompts you to use mental imagery and creative visualization to achieve a more peaceful state. A simple, yet powerful way, to reduce stress and recharge. These timely self-massaging techniques are a great way to energize tired hands, wrists and fingers. Developed by a licensed massage therapist. Here's your chance to teach kids the basics of proper stretching and workstation setup to encourage a lifetime of healthy computing. Perfect for PTA's, computer labs, classroom teachers or as a take-home for employees to share with their children. The perfect uplift for downtime. Melt away tension with these gentle, head-to-toe stretches. An example of a Custom FitStrip we can design to fit any industry or theme. Perfect for yoga studios needing a large imprint to communicate their message. Hours of keystrokes add up to tons of force! Here’s a safe and effective way to take the pressure off nerves that have been compressed by nonstop typing, mousing and restricted postures. We’ve made it easier than ever to remember essential ergo tips that keep recipients energized and focused all day long. Cool beach vibe with a large imprint area to promote your name, logo and special message.